Visitors standing at the main entrance to the Botanic Garden have an attractive view of the half-timbered house and the backdrop formed by the beech wood behind it. The large flowerbed at the entrance was originally planted with roses, but has been used since the garden’s beginning to present a changing variety of plants and herbaceous perennials, thus forming an eye-catcher for arriving visitors. The plants in the bog garden have always been worthy of special attention. 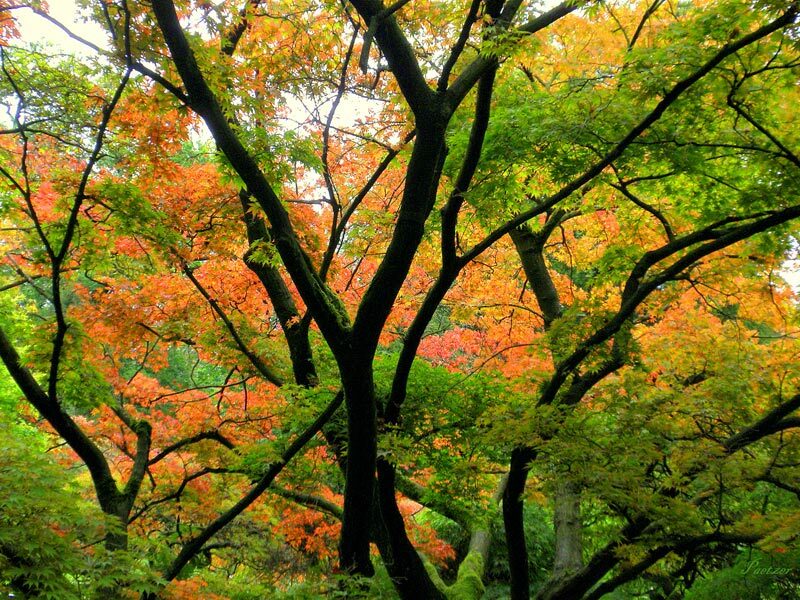 Particularly in the flowering season, the numerous species of azalea and rhododendron in front of the backdrop of the woods are truly a feast for the eyes. New designs and structural elements have been added time and again to the Botanic Garden since it was opened. A brief journey through time is thus possible, the various decades with their characteristic tastes being revealed, e.g. by the water-lily basin from 1927 with its adjoining area of lawn and pergola complete with seats from the 1960s, by the small show greenhouse from the 1970s and by the 1980s clock of geological periods. The fern steps constructed in recent years have also enhanced the Botanic Garden as have the garden courtyard with its pavilion and the colour garden laid out below the water-lily basin. 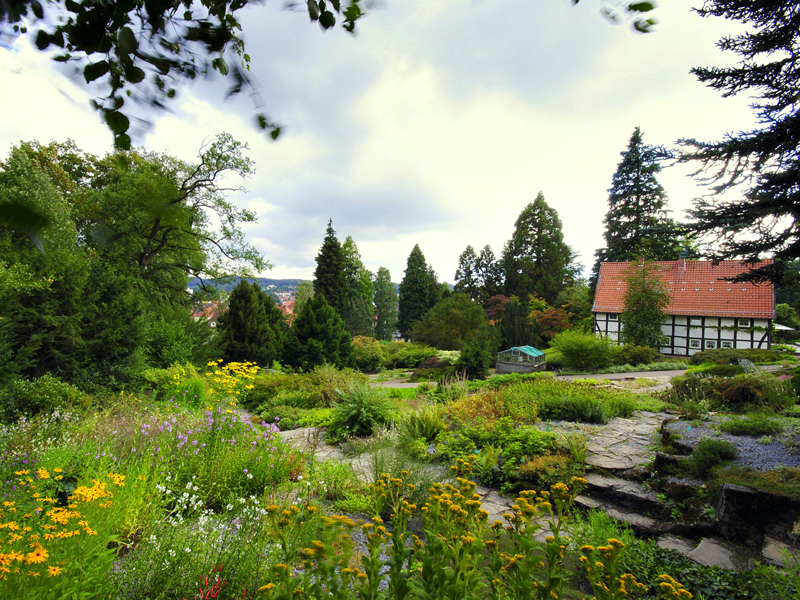 The Botanic Garden of Bielefeld was handed over to the public in summer 1912. Located close to the city centre, it became a popular area for recreation for the population in light of the increasing development of the city and the accompanying reduction in old garden spaces. The Botanic Garden has its origins in a large area of woodland and meadow covering approximately one hectare, which was bought by the city of Bielefeld in 1910 for the extension of the Johannisfriedhof (“St. John’s Cemetery”). Ultimately, however, the land was not required for this purpose because the city of Bielefeld established the Sennefriedhof instead. Paul Meyerkamp, who was garden inspector at the time, made use of the unused but topographically interesting and sunny location in order to create a Botanic Garden. The garden was conceived as a show garden for the general public and as an aid for school instruction. Any scientific aspect played a rather secondary role in its design – it was simply to be a feast for the eyes. The focal point of today’s garden is still a half-timbered house dating from 1823. In 1915, an alpine garden was created directly next to the house, making use of the sun-blessed south-facing slope. Even at that time, the alpine garden was home to 500 different species, which still grow and flourish there today. Visitors standing at the main entrance to the Botanic Garden have an attractive view of the half-timbered house and the backdrop formed by the beech wood behind it. The large flowerbed at the entrance was originally planted with roses, but has been used since the garden’s beginning to present a changing variety of plants and herbaceous perennials, thus forming an eye-catcher for arriving visitors. Its seasonal planting is changed from year to year. New designs and structural elements have been added time and again to the Botanic Garden since it was opened. A brief journey through time is thus possible, the various decades with their characteristic tastes being revealed, e.g. by the water-lily basin from 1927 with its adjoining area of lawn and pergola complete with seats from the 1960s, the small show greenhouse from the 1970s and the 1980s clock of geological periods. The fern steps constructed in recent years have also enhanced the Botanic Garden as have the garden courtyard with its pavilion and the colour garden laid out below the water-lily basin. Among the botanical highlights of the garden are impressive solitary trees such as the giant sequoia(Sequoiadendron giganteum), tulip tree (Liriodendron tulipifera) and handkerchief tree (Davidia involucrata) as well as the bushy gunnera (Gunnera manicata), also known as giant rhubarb, with its metre-sized flat leaves. Opened in May 1874, the Johannisfriedhof adjoining the Botanic Garden still has stretches of lush vegetation as well as an extensive lawn axis and a curving circular path, all of which distinguish it as a classic “park cemetery”. Laid out on the slope of the Kahler Berg (“Bare Mountain”) with a view of theSparrenburg (“Sparrenberg Castle”), the Johannisfriedhof was designed to correspond to the “refined sensibility of a cultivated civic appreciation of art”. Many well-known families from Bielefeld such as the Delius, Oetker, Bertelsmann and Kisker families acquired extensive family burial plots here, which were often garden-like in design. The numerous artistically interesting gravestones with their inscriptions in keeping with the spirit of the relevant period are a reflection of Bielefeld’s history and are well worth seeing. Visitors regularly come here to see the wonderful blossoms of the rhododendrons in spring as well as the “arboretum” with its huge red cedars, thujas and false cypress trees, which were once planted to the right and left of the plots in place of gravestones. The cemetery and a large number of tombs were given protected status in 1986. More and more people from Bielefeld have come to regard the Johannisfriedhof as a place where culture can be experienced alongside its role as a burial ground and as a green space for leisurely walks with connecting paths to the Botanic Garden and to Olderdissen Wildlife Park. A broad programme of free guided tours.